These are some of the training programs on offer, their duration and cost implications. At Rosegabriel Institute, the above form the core subjects in the entire Departments to enable the students achieve utmost perfection in their disciplines. Admission is open to all those capable of coping with lectures and practical work, and all those who have got basic knowledge, and wishes to advance their knowledge. At Rosegabriel Institute of Fashion and Textile Designs, these form the core subjects of the fashion program to enable the students achieve utmost perfection in the fashion industry. Interested candidates can always obtain the school integrated prospectus and timetable (with flexible teaching hours to meet with individual student needs) from the Registrar’s Office. 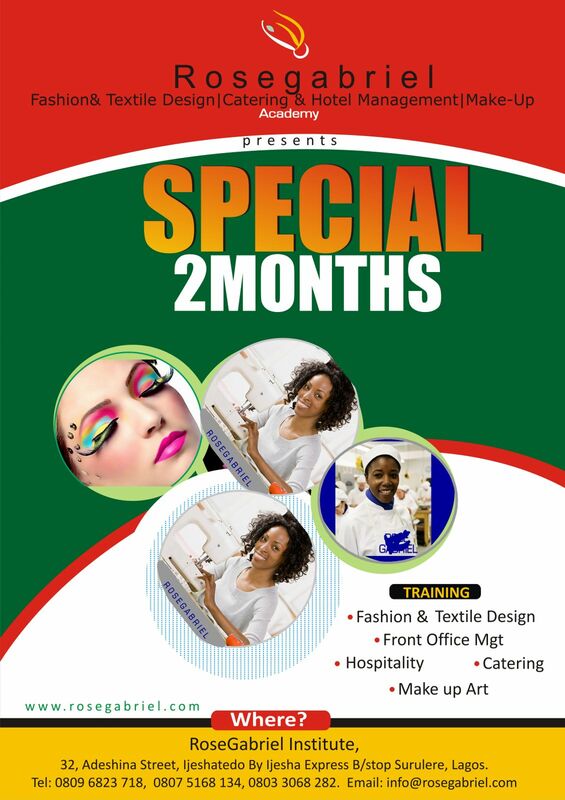 Admission is open to all those capable of coping with the lectures and practical work, and all those who have got basic knowledge in fashion (Tailoring & Designing) who wish to advance their knowledge.